Sierra Club Canada Foundation has been working to develop a network of community leaders protecting the integrity of Prairie ecosystems. Our dedicated volunteers focus on local issues important to their communities and act as proactive advocates for the environment. To get involved in the prairie region, contact Lindsay Boucher, Prairie Chapter Coordinator, at prairiechapter@sierraclub.ca. What's happening at the Prairie Chapter? Sierra Club Canada Foundation (SCCF) has been instrumental in advocating for green areas in urban settings for years in Alberta’s capital region. It was a great time for learning outdoors at Riverfest in Edmonton! 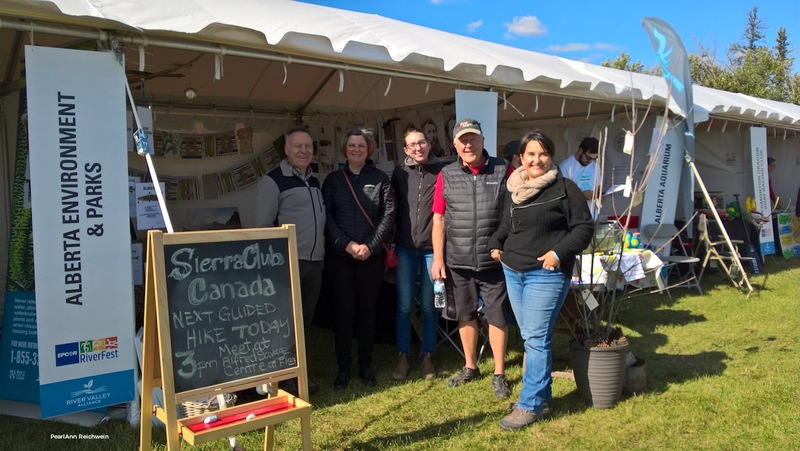 Thank you to all our volunteers, friends, and families for supporting Sierra Club Canada Foundation's Big Nature Tent for public education at Edmonton's inaugural Riverfest 2017. We appreciate your time, expertise, and creativity as a generous donation to conservation advocacy and a wonderful fall outing on the weekend of September 16th. Read more about It was a great time for learning outdoors at Riverfest in Edmonton! This year the Canadian Parks Conference 2017 was held in Banff National Park at the Banff Centre, overlooking Banff town and the Bow Valley from March 8-11.. Hosted by the Alberta Recreation and Parks Association with its partners the Canadian Recreation and Parks Association, and the Canadian Parks Council, the conference, which included many invited speakers and three hundred attendees, was an inspired four days of discussion. Bison thundered back into the wild Panther Valley of Banff National Park on Feb. 1, 2017. It was a history making event. Bringing to life a long-held dream, the restoration of bison to their natural habitat is a move designed to promote biodiversity and cultural reconnections. Most of Edmonton’s natural lands lie within its extensive river valley and tributary ravine systems – an area of 7,400 ha and 48 km in length, including 22 ravines, for a combined total length of 103 km. Much of the area is either under private ownership or targeted by City Parks for recreational infrastructure. Golf courses, gravel quarries, a velodrome and other sports facilities, freeways, boat launches… have all been proposed over the past decades for what is often “free land” to the City. Fortunately there are a growing number of local ENGOs actively involved in conservation of these lands with whom we partner or support on a project basis. Read more about Sand Dunes? In Edmonton! Years grow special strength in a tree. In 1874, John Muir climbed a tall tree and swung high in its branches in a storm. It was a moment he never forgot. He enjoyed the exhilaration of trees and storms many times throughout his life, and shared that passion through his writing and advocacy. The future is bright for moose in Edmonton, thanks to Sierra's Prairie Chapter volunteers and their partners. On August 31st, 2010, a study which was led by University of Alberta researchers was published in the journal Proceedings of the National Academy of Sciences, which conclusively shows that numerous highly toxic pollutants are being released into the Athabasca River and its tributaries by the development of the oil sands. The levels exceeded both federal and provincial government guidelines.